Home > How is a through bolt manufactured? How does a through bolt come about? At the other end of the line there is a strong steel wire on the roll, and at the other end, there comes about two pieces per second of Sormat’s most popular product, the through bolt. Let’s see how the hit product is manufactured. At the beginning of the line, the steel wire is first straightened by drawing it through a die and then cleaned. The machine then makes the finished body in four different stages of forming. In cold forming, a raw force is used to press the steel into the shape. – There are hundreds of tons of compression power in the machines. Thanks to the cold forming, the cone surface is tough and smooth. This, in turn, provides a fast and reliable tightening of the expansion sleeve, says Sormat’s Production Director Jukka Huikkonen. After that, in the fifth stage, the same machine performs the molding of the threads to the steel. – The thread made in this way is very strong and accurate. Finally, the anchor is washed off the oils and sent to galvanizing. Some of the through bolts are hot-dip galvanized, some of them are made of acid-resistant steel. When the body part comes from galvanizing, the final product is assembled. The through bolt has four parts: the body itself, the expansion sleeve, the nut, and the wedge. The 3-piece expansion sleeve ensures smooth spreading and secure anchorage. The knuckles of the expansion sleeve effectively bite into the inner surface of the drilled hole in the concrete and tighten the anchor firmly. In the assembly phase, these four parts are joined together. There are 12 machines in the production facilities that handle the job. Anchors of different diameters have their own machines. The product is then packed on an automated packaging line. 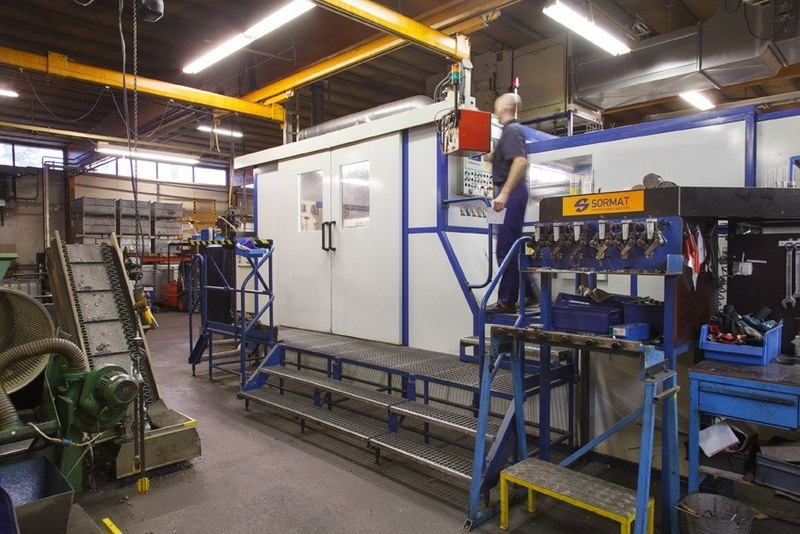 Sormat manufactures an average of 100,000 through bolts a day, but in high season in the spring and summer, the machines will sink up to 130,000 through bolts per day. The factory rotates in two shifts except for the plastic section, which makes the plugs round the clock. There are fifty permanent employees in production and stock. About 75% of production is exported to Russia, Scandinavia, and Germany.